Received Email is normally placed in your inbox. Unread emails are shown in bold type, and emails that you have read are shown in normal type. To read an email double click the message and it opens so you can read it. The message is immediately marked as read. Once the message is open for reading you can use the up and down arrows (top right of message) to scroll through your email messages. To reply to an email. Locate the email and mouse over the message. A drop down box appears . Click on send email. 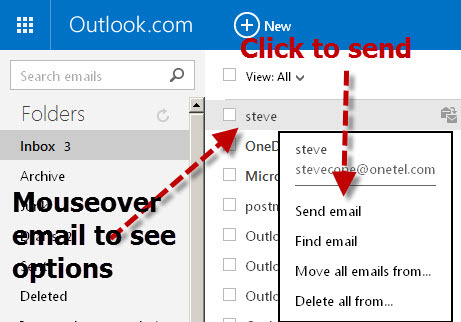 A new message window opens with the to field already filled with the email address of the original sender. You can add other recipients to the to line and use the cc and bcc fields,insert attachments etc just like with any message you send. Enter a subject and your message and hit send. Note: The reply message will contain the original message and the reply but not the original attachments if any were received. Click on the message to open it for reading and in the top blue menu bar click the drop down arrow next to Reply. 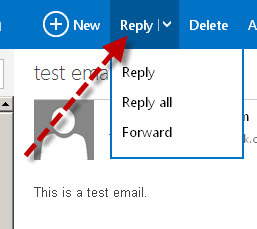 A drop down menu appears to reply,reply all and forward the message. 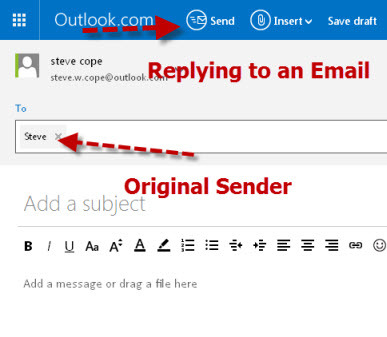 If you use the reply to all then the message will be sent to the email sender, and also to all of the original recipients i.e. those recipients whose email address was on the to or cc line of the original email. You should be careful when using the reply to all option. If you forward an email then you need to enter the recipient address in the to field, and you can cc or bcc the message just as you can with any other message. Note: The forwarded message will contain the original message and the reply and the original attachments if any were received. 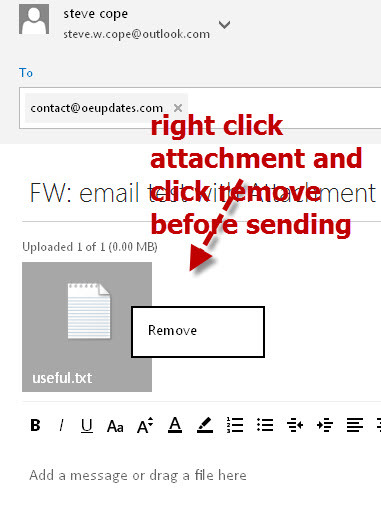 You can remove the attachment before forwarding if you want. Note: Don’t forward large attachments unless you really need to. Here is a video that takes you through the process.